I went to see Winnie the Pooh yesterday morning, and while waiting in line, a woman was getting tickets to Harry Potter and the Deathly Hallows Part 2. She asked how busy it will be, and the man at the box office said it was not too bad yet. She said, "oh all the crazies have watched already?" Lady, if I'm crazy, then I don't want to be sane. Yes, I was one of those people who bought my midnight screening ticket weeks ago, and lined up at least two hours to see the finale of this saga even though I had to be at work at 8 AM that morning. I also went to the midnight release of the final book. It's always a festive atmosphere, some people dressed in costumes, or the simple scar over the eyebrow, waving wands, wearing HP t-shirts. There was even a duel at the theater I was in. There was lots of cheering, hooting & hollering & carrying-on, and clapping inside the theater. This last HP film was everything I hoped it would be: a fitting conclusion to the enthralling tale of The Boy Who Lived that has held popular culture hostage for several years now. Director David Yates and screenwriter Steve Kloves have again condensed JK Rowling's book into an elegant and terrifying epic film. There were some plot changes in the interest of good story-telling but I didn't mind them at all. Because it is all-out war in the wizard world, the action is intense and fierce. The production design and cinematography? Outstanding! The muted, gray but beautiful tones blend in nicely with the unobtrusive special effects. The best parts are still the human struggles our wizards and witches go through. Don't forget the tissues or hankies. Or at least conjure up a little vial to catch your tears. Most familiar characters return. Each sighting brought a smile to my face. 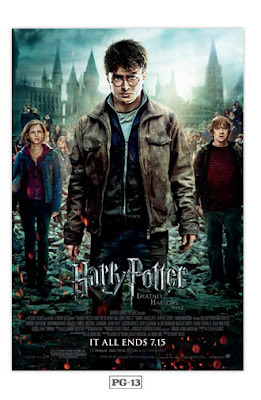 The 3 main characters are excellent of course, as well as Ralph Fiennes's vile Voldemort. Noteworthy moments or scenes? Plenty! Professor McGonagall's (Maggie Smith) reaction to Harry. The grief, bitterness, anger, and cynicism of Aberforth Dumbledore (Ciaran Hinds, who I didn't recognize under the make-up). Helena Bonham-Carter's brilliant and funny portrayal of Hermione pretending to be Bellatrix Lestrange, and of course her crowd-pleasing duel with Mrs. Weasley (a ferocious Julie Walters). Kelly MacDonald's scary Grey Lady. The awesomeness of Neville Longbottom (Matthew Lewis). The worry and anguish of the Malfoys (Jason Isaacs and Helen McCrory). (Death Eaters love their children, too.) Albus Dumbledore with Harry at King's Cross. The Lord of the Rings-esque view of the battling armies. Ron and Hermione's first kiss. And of course, Alan Rickman's heartbreaking Severus Snape. The brutality with which the vulgar Dark Lord dispenses of him makes the Prince's Tale even more tragic. Having re-read the book from where Part 1 left off, I was surprised at how quickly the plot moved. (It is a short 130 minute movie.) I wanted things to slow down, so I can savor every detail, every moment. It was hard to watch knowing that this was it. Like my sister's text message said after: "What are we going to do with our lives now?" So with a sense of loss, joy, sadness, and nostalgia, we bid our magical friends adieu. We honor JK Rowling for her imagination and genius; obvious affection for her characters and the world they lived in; and her respect for us readers. Harry Potter world was a place like no other, yet very much like our own Muggle-verse. It is populated by characters noble/ignoble, heroic/cowardly, intelligent, selfish, ambitious, racist/accepting, courageous. People are good and not so good. Things are black, white, and somewhere in between. It is this polarity in society that the author and filmmakers have reflected back to us. There's a little devil in all of us. The fact that we can conquer and overcome this darkness is what gave the series its power. To those mourning the end, do not fret. We can always return to their world and momentarily escape our humdrum lives by picking up the books, or putting on the DVDs. Some wise person said after all, that "Help will always be given at Hogwarts to those who ask for it." So thank you JKR for your help---we didn't even know we needed it.